When I made this for the first time, I put it on the stovetop to cool, and I couldn’t stop eating it. It. Was. Delish. It was so good, that when we were getting dinner ready (kind of a hodge podge that night), I asked my husband if he was going to have it for dinner, and he replied, “Well, probably not. (At this point I was a little disappointed, and then he said…) As I’ve been getting the boys’ dinner ready, I’ve been picking at it, and I can’t stop. It’s really good.” And my heart melted. I always get really happy when my family likes the dishes I make. This is a keeper and we will definitely be adding it to our regular rotation. Oh, and we made the kids try it. One didn’t really like it (he hates Brussel sprouts), but the other LOVED the chicken but decided that next time, I should leave the Brussel sprouts out. Ummmm, no, because that’s my favorite part. Preheat oven to 400° F. Place chicken on baking sheet and coat with 1 ½ tbsp. olive oil and sprinkle with salt and pepper. On a separate baking sheet lined with parchment paper, arrange with Brussel sprouts and coat with 1 ½ tbsp. olive oil and a sprinkle of salt and pepper. Roast the chicken and Brussel sprouts for about 20-25 minutes until Brussel sprouts are browing and are fork tender, and chicken is cooked through. Midway through, flip the chicken and toss the Brussel sprouts to ensure even roasting. 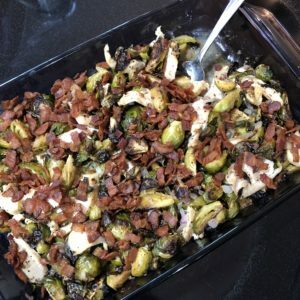 While chicken and Brussel sprouts roast, cook the bacon in a large skillet until crisp, drain and set aside. For the sauce, heat a medium saucepan over medium heat and add 3 tbsp. cooking fat. Add the onions and cook until translucent, then add the garlic and cook until onions are soft. Whisk the cornstarch into the broth and add it to the pan. Immediately add the coconut milk, mustard and nutritional yeast (if using), while whisking. Raise the heat and bring to a boil, stirring. Once boiling, reduce the heat to low and simmer for another minute until nice and thick. Stir in salt and pepper to taste, rosemary and sage, and remove from heat. Cut chicken into bite sized pieces or shred and arrange in a casserole dish. Add the Brussel sprouts and sauce mixture and stir to evenly coat. Crumble the cooked bacon and sprinkle on top. Cook in the preheated oven for 15-20 minutes until heated through. Serve hot and enjoy!